eIF2B is a dedicated guanine nucleotide exchange factor for eIF2, the GTPase that is essential to initiate mRNA translation. The integrated stress response (ISR) signaling pathway inhibits eIF2B activity, attenuates global protein synthesis and upregulates a set of stress-response proteins. Partial loss-of-function mutations in eIF2B cause a neurodegenerative disorder called Vanishing White Matter Disease (VWMD). Previously, we showed that the small molecule ISRIB is a specific activator of eIF2B (Sidrauski et al., 2015). Here, we report that various VWMD mutations destabilize the decameric eIF2B holoenzyme and impair its enzymatic activity. ISRIB stabilizes VWMD mutant eIF2B in the decameric form and restores the residual catalytic activity to wild-type levels. Moreover, ISRIB blocks activation of the ISR in cells carrying these mutations. As such, ISRIB promises to be an invaluable tool in proof-of-concept studies aiming to ameliorate defects resulting from inappropriate or pathological activation of the ISR. Eukaryotic translation initiation factor 2B (eIF2B) is the essential heteropentameric guanine nucleotide exchange factor (GEF) for the GTPase eukaryotic translation initiation factor 2 (eIF2). eIF2 forms a ternary complex with GTP and the initiator methionyl tRNA (Met-tRNAi). During each round of mRNA translation initiation, GTP is hydrolyzed, Met-tRNAi is incorporated into the nascent polypeptide and eIF2-GDP is released from the translating ribosome (reviewed in Hinnebusch and Lorsch, 2012). eIF2B is required to catalyze GDP-GTP exchange on eIF2, which enables rebinding of Met-tRNAi and a new round of protein synthesis. In the context of normal physiology, transient inhibition of eIF2B GEF activity is a critical step in the activation of the conserved integrated stress response (ISR). In mammalian cells, four different stress-responsive kinases (PERK, GCN2, HRI and PKR) initiate the ISR by phosphorylating serine 51 in the α subunit of eIF2 (eIF2α). eIF2 in this phosphorylated state (eIF2α-P) binds more tightly to eIF2B and inhibits its activity resulting in rapid depletion of ternary complex and a reduction in bulk protein synthesis (Krishnamoorthy et al., 2001; Yang and Hinnebusch, 1996). The decrease in ternary complex paradoxically promotes translation of a subset of mRNAs, among them activating transcription factor 4 (ATF4). These transcripts escape the global inhibition of translation due to the presence of short upstream open reading frames (uORFs) in their 5’ untranslated region (Palam et al., 2011; Vattem and Wek, 2004) Sheltered from the ISR, the expression of these genes during mild stress promotes cell survival. However, severe stress and sustained activation of this program can also promote pro-apoptotic pathways. Given the central role of eIF2B and the ISR in modulating cell physiology, it is unsurprising that dysregulation of this pathway has pathological effects. One prominent example is Vanishing White Matter Disease (VWMD), a rare, autosomal recessive leukodystrophy directly caused by mutations in eIF2B. VWMD is defined by chronic demyelination, with patients presenting with a spectrum of neurological symptoms including ataxia, spasticity, seizures and cognitive impairment (Schiffmann et al., 1994; van der Knaap et al., 1997). Age of disease onset is variable, and can be broadly categorized as early infantile, early childhood, late childhood/juvenile, and adult forms. The age of disease onset is correlated with severity and speed of progression, with younger cases being more severe (Fogli et al., 2004a; Labauge et al., 2009). Since the discovery of the first VWMD causal mutation in eIF2B (Leegwater et al., 2001), more than 170 mutations spanning all five subunits of the eIF2B complex (α, β, γ, δ, ε) have been cataloged in the NCBI ClinVar database. Patients harbor either homozygous mutations, or display a compound heterozygous genotype, with a different mutation in each allele of the same eIF2B subunit gene. Because eIF2B activity is essential and all subunits are required in mammalian cells, mutations in the GEF domain of the ε catalytic subunit (which would be more likely to abrogate activity) are rare. Instead, eIF2B VWMD mutations reportedly cause a partial reduction in GEF activity (Fogli et al., 2004b; Horzinski et al., 2009; Li et al., 2004; Liu et al., 2011; de Almeida et al., 2013). Interestingly, while some experiments with patient-derived samples suggest a correlation between eIF2B activity and age of VWMD onset (Fogli et al., 2004b; Horzinski et al., 2009), others found no association with disease severity (Liu et al., 2011; van Kollenburg et al., 2006a). The interpretation of these experiments is complicated by the diverse genetic backgrounds of the samples. Thus, further work is needed to clarify the relationship between eIF2B GEF activity and VWMD. Markers of ISR activation have been identified in VWMD brain tissue by immunostaining assays (van Kollenburg et al., 2006b). Since eIF2B GEF activity is constitutively reduced in patient cells, further inhibition by eIF2α-P could lead to persistent ISR induction and chronically reduced protein synthesis. This is consistent with the clinical description of VWMD pathology accelerating in response to stresses such as head trauma, fever and viral infection. Questions remain about the relative contributions of chronically reduced protein translation and stress pathway activation to white matter pathology, but recent work suggests that eIF2B VWMD mutations lead to defects in white matter astrocyte maturation (Bugiani et al., 2011; Dooves et al., 2016) and disrupt mitochondrial oxidative phosphorylation (Raini et al., 2017). ISRIB (for ISR inhibitor) is a potent small molecule that attenuates the ISR by binding and activating eIF2B (Sidrauski et al., 2013, 2015). The five subunits of eIF2B assemble into a decameric (αβδγε)2 complex (Kashiwagi et al., 2016; Wortham et al., 2014). The homologous α, β and δ subunits form a hexameric α2(βδ)2 regulatory subcomplex containing the interaction site for eIF2α-P (Bogorad et al., 2014; Kuhle et al., 2015). The γ and ε subunits share a common ancestor and form a catalytic heterodimeric (γε) subcomplex. Two γε subcomplexes flank the core regulatory subcomplex to assemble the decameric holoenzyme. We proposed that ISRIB, a symmetrical molecule, stimulates eIF2B function by binding at the mirrored (βδ)2 interface and promoting the assembly of the more active decameric complex (Sidrauski et al., 2015). In agreement with this model, mutations in the δ subunit were identified that make the complex insensitive to the action of ISRIB (Kashiwagi et al., 2016; Sekine et al., 2015). By enhancing eIF2B activity, ISRIB increases the levels of ternary complex, restoring protein synthesis and attenuating the induction of the ISR in cells. Because eIF2B mutations cause VWMD, this disease is an ideal model to investigate pathogenic ISR activation and the effects of ISRIB in such a setting. However, it is unclear whether ISRIB can interact with the wide range of eIF2B mutant complexes found in VWMD patients, and if so, whether it can rescue their residual GEF activity to sufficient levels. To measure the effect of VWMD mutations on GEF activity and their responsiveness to ISRIB, we deployed two complementary approaches: biochemical assays with reconstituted mutant eIF2B complexes, and cell-based assays utilizing CRISPR-Cas9 to introduce various VWMD mutations in an isogenic background. We found that VWMD mutations destabilize the decameric eIF2B holoenzyme, directly correlating with GEF activity impairment. Addition of ISRIB stabilized recombinant mutant eIF2B complexes in the decameric form, enhancing their residual GEF activity to wild-type levels. ISRIB also restored the GEF activity of lysates derived from mutant cells to the level of the isogenic wild-type. In all mutant cells, ISRIB significantly attenuated the two outputs of the ISR: the global reduction in protein synthesis, and the induction of ATF4. Collectively, our data demonstrate that VWMD mutations in eIF2B that compromise its enzymatic activity do so by disfavoring decameric complex formation, and ISRIB rescues a wide range of mutations by stabilizing a more active decameric complex irrespective of the nature of the crippling mutation. In order to isolate the effect of pathogenic VWMD mutations on eIF2B GEF activity, we first developed an assay using purified recombinant human complexes. A minimal defined system requires substrate (heterotrimeric eIF2 complex), enzyme (heteropentameric eIF2B complex) and a method of monitoring reaction kinetics. We expressed and purified recombinant human eIF2 from human cells (Figure 1A and B), and loaded it with a fluorescent GDP analog, Bodipy-FL-GDP. The fluorescence quantum yield of this analog is increased upon protein binding and quenched in solution; release of Bodipy-FL-GDP from eIF2 is thus measured as a time-dependent decrease in fluorescence (Sekine et al., 2015). In the presence of excess unlabeled GDP, the fluorescence signal of Bodipy-FL-GDP follows a pattern of single-exponential decay. As previously reported, eIF2 alone exhibits a slow intrinsic rate of GDP exchange (t1/2 > 70 mins; Figure 1C; Panniers and Henshaw, 1983). eIF2B isoforms have identical GEF activity and ISRIB alters the sensitivity of eIF2B to eIF2 phosphorylation. (A) Coomassie-stained SDS-PAGE gel of recombinant human eIF2 used as a substrate in the in vitro GEF assays. (B) Multi-angle light scattering analysis of purified eIF2, indicating good agreement between measured and expected molecular weights for the heterotrimeric complex. (C) eIF2B stimulates GDP release from eIF2 that is further enhanced by addition of ISRIB. Bodipy-FL-GDP was loaded onto eIF2, and its release measured over time as a decay in fluorescence with or without eIF2B and ISRIB. Representative fluorescence intensity curves are shown. Intensities were normalized to the starting values for the no-eIF2B control condition. (D) Coomassie-stained SDS-PAGE gels of purified recombinant human eIF2B complexes. (E) Multi-angle light scattering analysis of purified WT eIF2B. The (αβδγε)2 complex (δ2 isoform) ran as a 10mer. The βδγε subcomplex ran as a 4mer, whereas the α subunit forms a homodimer. Combining separately purified βδγε and α subunit reconstituted the 10mer. The dashed gray line marks the 7 ml elution position to facilitate comparisons between plots. (F) δ1 and δ2 isoforms of eIF2B behaved identically with respect to GEF activity and response to ISRIB. 5 nM phospho-eIF2 was included in the assay. (G) Dose-response curves of GDP release half-life in the presence of increasing amounts of phospho-eIF2. The curves of δ1 + ISRIB (grey) and δ2 + ISRIB (green) overlap each other. For (F) and (G), half-lives of GDP release at each ISRIB concentration were calculated by fitting single-exponential decays to the Bodipy-FL-GDP fluorescence decay curves. Each point represents 9 measurements from three independent experiments (mean ± SD). Based on crystallographic and mass spectrometric data (Kashiwagi et al., 2016; Kuhle et al., 2015; Wortham et al., 2014), the βδγε subunits of eIF2B form a stable heterotetrameric subcomplex in vitro, which can be further ‘dimerized’ by association with an α2 subcomplex to form the decameric holoenzyme. We co-expressed and affinity-purified either all five wild-type eIF2B subunits together from human cells, or the βδγε and α subunits separately (Figure 1D). We reasoned that the first approach would allow us to selectively obtain pre-formed eIF2B decameric complexes, whereas the second approach would allow us to reconstitute the process of holoenzyme assembly in vitro. Co-expression of five eIF2B subunits yielded a purified complex with a size corresponding to the predicted (αβδγε)2 decamer, as determined by multi-angle light scattering (Figure 1E). Expression of the α subunit by itself produced a homodimer, whereas a heterotetramer was formed by βδγε in the absence of α (Figure 1E). Thus, the purification process yielded intact subcomplexes containing equimolar quantities of each eIF2B subunit. Addition of purified eIF2B decamer to eIF2 stimulated GDP release and increased the rate of fluorescence decay (t1/2 = 20 mins; Figure 1C). Consistent with prior results, the stimulatory effect of eIF2B on eIF2 GDP release was further enhanced by addition of ISRIB in a dose-dependent manner (Sekine et al., 2015; Sidrauski et al., 2015). The combination of βγδε and α2 behaved similarly to the pre-formed decameric complex (see below). The eIF2B δ subunit exhibits alternative splicing, producing two isoforms, δ1 and δ2, which differ only at their N-terminal region (Figure 1—figure supplement 1A; Kuhn et al., 2009). Prior work in cells suggested that the longer and less-studied δ1 isoform may render eIF2B insensitive to inhibition by eIF2α phosphorylation by weakening the eIF2-eIF2B interaction (Martin et al., 2010). As a first step, we used our reconstituted system as a platform to compare the two different δ isoforms. We purified decamers of both isoforms (Figure 1D) to compare their effectiveness at stimulating GDP release. Additionally, we stoichiometrically phosphorylated trimeric eIF2 at serine 51 of its α subunit using recombinant PERK kinase, to serve as an eIF2B inhibitor in the GEF assay. We found that the δ1 and δ2 isoforms had similar basal GEF activity and responded similarly to ISRIB stimulation (EC50 = 0.8 nM and 1.2 nM, respectively; Figure 1F). Next, while keeping the total eIF2 concentration constant, we titrated phospho-eIF2 into the system to a maximum of two-fold excess over unphosphorylated eIF2. As expected, the GDP release t1/2 increased asymptotically with addition of phospho-eIF2 (Figure 1G), approaching the intrinsic rate of eIF2 GDP release without eIF2B. In contrast to previous reports, we observed no difference between the two δ isoforms in their response to phospho-eIF2. Notably, we showed that ISRIB equally reduced the inhibitory effect of phospho-eIF2 on both isoforms, such that even a 2:1 ratio of inhibitor:substrate was insufficient to block eIF2B activity. We conclude that there is no difference between the two δ isoforms under our experimental conditions. The results above validated our assay as a sensitive and reproducible method to monitor the GEF activity of recombinant eIF2B complexes. Based on these measurements, we generated VWMD mutants in the background of eIF2B with the δ2 isoform, which is the predominant isoform in vivo (Martin et al., 2010). All subsequent experiments also included a small fraction of unlabeled phospho-eIF2 (5 nM added to 25 nM eIF2:Bodipy-FL-GDP) in the assays to increase the dynamic range of the response to ISRIB stimulation. With an in vitro measurement system in place, we next examined the effects of pathogenic VWMD mutations on the GEF activity of eIF2B. Using the structure of S. pombe eIF2B as a guide, we selected five VWMD mutations that vary in their location within the eIF2B complex and the severity of the resulting disease (Figure 2A and Table 1). Two of the mutations reside in the αβδ regulatory subcomplex. αV183F, located at the interface of the α-α homodimer, has been shown to abolish dimer formation (Wortham et al., 2014). Similarly, δR483W is predicted to disrupt a key β-δ heterodimer interaction that is important for tetramerization of the (βδ)2 subcomplex. R113 in the catalytic ε subunit contacts the β subunit and the mutation of Arg to His likely destabilizes the interaction between the catalytic and regulatory subcomplexes (Kashiwagi et al., 2016). εR113H is one of the most prevalent VWMD mutations (Table 1). We also generated εR136H and εR195H mutations, which are surface-exposed and buried residues, respectively. Patients with the εR136H mutation exhibit classical disease progression (Kantor et al., 2005), whereas the εR195H mutation results in a severe, early-onset form of VWMD known as Cree leukoencephalopathy (Black et al., 1988; Fogli et al., 2002). Notably, animal models have been generated for the δR483W, εR136H and εR195H mutations, and they recapitulate important aspects of the human disease (Dooves et al., 2016; Geva et al., 2010). Recombinant eIF2B VWMD mutants have reduced GEF activity and complex stability that is rescued by ISRIB. (A) VWMD mutations tested in this study, visualized as spheres on the structure of S. pombe eIF2B (PDB: 5B04; Kashiwagi et al., 2016). The human mutation sites are shown in plain text and the corresponding yeast residues in superscript. For clarity, only one of each pair of residues is labeled. (B) Half-lives of GDP release for recombinant WT and VWMD eIF2B, calculated by fitting single-exponential decays to the Bodipy-FL-GDP fluorescence decay curves. All VWMD mutants except εR136H had reduced GEF activity that is significantly stimulated by ISRIB (p<0.001). Significance is shown for comparisons of each mutant to WT and between selected mutants. **p<0.005, ***p<0.001, ns, not significant. (C) ISRIB EC50 values calculated from dose-response measurements in GEF assays (individual curves shown in Figure 2—figure supplement 1A). Significance is shown for comparisons of each mutant to WT. **p<0.01, ***p<0.001. (D) Dose-response curves of GDP release half-life in the presence of increasing amounts of WT or V183F α subunit. For (B)-(D), half-lives of GDP release at each ISRIB/α concentration were calculated by fitting single-exponential decays to the Bodipy-FL-GDP fluorescence decay curves. Each point represents 9 measurements from three independent experiments (mean ±SD). (E) All eIF2B VWMD mutant complexes except εR136H have reduced complex stability compared to WT. Size-exclusion chromatograms of reconstituted wild-type and VWMD mutant eIF2B complexes in the presence of 300 mM NaCl. The elution positions of the (αβδγε)2 10mer and βδγε 4mer are indicated. A cartoon schematic of 10mer formation is shown above the graphs. (F) Quantification of eIF2B 10mer:4mer peak ratios from (E), which serves as a measure of complex stability (N = 3, mean ± SD). *p<0.05, ***p<0.001, ns, not significant. Significance is shown for comparisons to WT within a condition (vehicle or ISRIB). Between conditions for a given construct, all differences were significant (p<0.005). To better control for the effects of these mutations on eIF2B holoenzyme formation, we expressed them as separate βγδε and α2 subcomplexes and combined equimolar amounts of each subcomplex for the GEF assay. Similar to wild-type proteins, all the mutant subcomplexes purified to homogeneity with similar yield (Figure 1—figure supplement 1B). Wild-type eIF2B promoted GDP release from eIF2 with t1/2 = 12.2 mins (Figure 2B and Figure 2—figure supplement 1A). Under identical conditions, every VWMD mutant except εR136H had significantly slowed GDP release. αV183F had 33% of wild-type basal activity, whereas δR483W, εR113H and εR195H had 28%, 61% and 56% activity, respectively. Thus, 4 out of 5 VWMD mutations tested in this fully reconstituted system exhibited compromised GEF activity. The wild-type GEF activity of the εR136H mutant complex is intriguing. It is possible that the mutation destabilizes the endogenous ε subunit in cells. However, no reduction in the affected subunit was observed in cerebellar lysates from mice carrying this mutation and a 23% reduction in GEF activity was reported (Geva et al., 2010). In our assay, ISRIB stimulated the activity of wild-type eIF2B ~ 2X in a dose-dependent manner (EC50 = 0.9 nM; Figure 2B and C; Figure 2—figure supplement 1A). 50 nM ISRIB successfully rescued the activity of the VWMD mutants, with stimulation ranging from 1.8X for αV183F up to 7.4X for δR483W (Figure 2B). Indeed, the ISRIB-rescued GEF activity of every mutant except αV183F exceeded the level of basal wild-type activity. The similar ISRIB EC50 values across wild-type and VWMD mutant complexes (Figure 2C) indicate that the mutations do not affect the ability of ISRIB to bind to eIF2B and stimulate its GEF activity. In the case of the δR483W mutant, the ISRIB EC50 was lower than wild-type, indicating that ISRIB was actually more effective at enhancing the activity of this mutant. αV183F is unique among the mutations tested in this study because it is the only one that affects the α2 homodimer instead of the βδγε subcomplex. Unlike the other mutations, ISRIB was unable to normalize its activity to wild-type levels even though the EC50 was unchanged (Figure 2B and C). To further characterize this mutation, we performed a GEF assay with wild-type βδγε and titrated αWT or αV183F. It has been shown that the heterotetramer containing the catalytic eIF2Bε subunit retains a low level of GEF activity that is enhanced by supplementation of eIF2Bα (Williams et al., 2001). Consistent with this, we observed that the activity of βδγε was <30% of decamer (Figure 2D, compare left-most point of black curve against points with >2.5 nM eIF2Bα). βδγε activity was stimulated 2.3X in the presence of 50 nM ISRIB (Figure 2D, compare left-most points of black and gray curves), concomitant with stabilization of a more-active octameric form (Figure 2D and Figure 2—figure supplement 1B). Addition of α subunit increased GEF activity in a concentration-dependent manner, with Km = 6 nM for αWT and 246 nM for αV183F; 40X more mutant subunit was required to achieve the same level of GEF activity compared to wild-type (Figure 2—figure supplement 1C). Thus, dimerization of the α subunit, which is abolished by the V183F mutation, provides a critical avidity effect that promotes eIF2B complex formation and activity. ISRIB shifted the Km of αWT and αV183F to 4 nM and 88 nM, respectively. The assays in Figure 2C were performed with 3 nM eIF2B, which explains the incomplete rescue of αV183F mutant activity by ISRIB; under those conditions, α concentration was still 30X below the αV183F Km. We show that using sufficiently high concentrations of αV183F, wild-type levels of GEF activity are achievable, both in the absence and presence of ISRIB (Figure 2D). In conclusion, we show that four different VWMD mutant eIF2B complexes display deficient GEF activity in a fully reconstituted system. ISRIB enhanced the activity of all generated mutants, even in a case where the biochemical consequence of the disease-causing mutation (εR136H) could not be readily assessed. Having established that VWMD mutant complexes show compromised GEF activity, we wondered how this impairment was elicited by the various mutations that affect different subunits. A clue came from comparing the activity of tetrameric (-α2 dimer) and decameric (+α2 dimer) eIF2B; the former is significantly poorer at stimulating GDP release (Figure 2D; compare activity of tetramer before and after addition of α subunit). We postulated that some VWMD mutations might destabilize the eIF2B holoenzyme, thus leading to reduced activity. To examine the ability of eIF2B complexes to form decamers, we combined the purified βδγε and α2 subcomplexes, and subjected the mixtures to size-exclusion chromatography (SEC). We used an elevated salt concentration (300 mM) to destabilize the eIF2B complex slightly and increase the dynamic range of the assay, allowing us to interrogate the effect of the pathogenic mutations as well as the ability of ISRIB to enhance decamer formation. A similar approach was previously used to demonstrate the stabilizing effect of ISRIB on eIF2B-containing lysates by sucrose gradient (Sidrauski et al., 2015). Wild-type eIF2B readily formed a decamer as the major species, eluting at 12.7 mL on the SEC column (Figure 2E and Figure 2—figure supplement 2A). A minor peak corresponding to the βδγε tetramer was observed at 14.1 mL, whereas the α2 homodimer eluted at 16.7 mL. By calculating the ratio of peak areas for decamer:tetramer (R10/4), we obtained a simple metric for complex stability (Figure 2F). The wild-type complex had a R10/4 of 5.2 under these assay conditions. Remarkably, αV183F, δR483W, εR113H and εR195H had decreased R10/4s of 0.6, 2.0, 4.6 and 4.0, respectively, demonstrating that these pathogenic mutations destabilize the decameric eIF2B complex (Figure 2E–F and Figure 2—figure supplement 2A). The εR136H mutant had a R10/4 of 8.5, indicating decamer stability as good as, if not better than wild-type. We repeated the SEC experiment, but with the mobile phase supplemented with 200 nM ISRIB. In agreement with our hypothesis, we observed a collapse of the tetramer peak and an increase in the decameric species for all eIF2B constructs (Figure 2E and Figure 2—figure supplement 2A). This change was particularly large for the αV183F mutant, which underwent an 8.2X increase in R10/4 to 4.9 after ISRIB addition, which is comparable to that of wild-type complex in the absence of drug (Figure 2F). Our data show that decamer formation is presumably correlated with eIF2B function (GEF activity of wild-type ~ εR136H > εR113H ~ εR195H > αV183F > δR483W). The αV183F mutation produced a particularly severe effect on complex stability, but the GEF activity of the mutant is better than expected because its βδγε subcomplex is wild-type. By contrast, the other mutants fall into a distinct class wherein defects affect the heterotetrameric subcomplex directly. Our results suggest that VWMD mutations that impair GEF activity may do so via a common mechanism of destabilizing the decameric eIF2B holoenzyme. This could explain why compound heterozygote alleles lead to VWMD; there are many non-targeted ways to push a complex away from optimal stability. The existence of over 170 eIF2B mutations in human VWMD likely reflects the ease with which the multi-subunit eIF2B assembly can be disrupted. To our knowledge, this is the first demonstration that ISRIB can engage with mutant eIF2B complexes, stabilize formation of the highly active decamer, and rescue GEF activity in vitro. As a further test of our hypothesis that eIF2B decamer formation drives enhanced GEF activity, we wondered whether we could generate a synthetic VWMD-like mutation that would also be resistant to ISRIB stimulation by mutating residues in the vicinity of the ISRIB binding pocket. 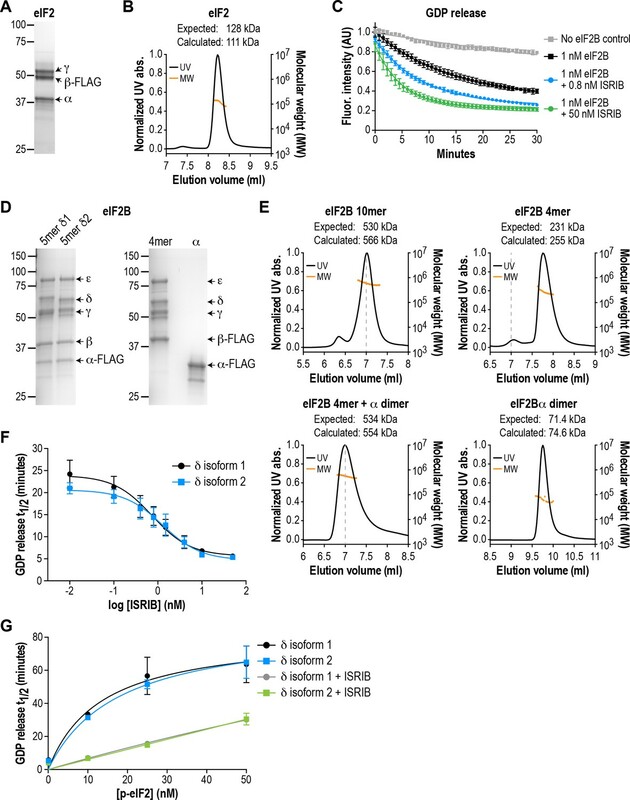 eIF2Bδ is a key mediator of ISRIB binding, based on unbiased activity-based screening (Sekine et al., 2015) and biochemical stabilization assays (Sidrauski et al., 2015). Modeling of the ISRIB-resistant mutations from the activity-based screen onto the S. pombe eIF2B structure placed them near the pseudo-twofold rotational axis of eIF2B (Kashiwagi et al., 2016), consistent with the proposed mechanism of stabilization. Examination of the eIF2B crystal structure revealed a cavity at its core that could potentially accommodate ISRIB; the ISRIB-resistant mutants form part of the surface of this space (Kashiwagi et al., 2016). To date, no VWMD mutations have been identified in this immediate region. We identified another cavity-facing residue in the δ subunit, L487, which also packs against the adjacent β subunit (Figure 3A). We reasoned that introducing a bulky residue at the L487 position might simultaneously disrupt both eIF2B complex stability and ISRIB binding. ISRIB-resistant mutants in the δ subunit can exhibit WT or VWMD-like stability and GEF activity. (A) ISRIB-resistant mutations tested in this study, visualized as spheres on the structure of S. pombe eIF2B (PDB: 5B04; Kashiwagi et al., 2016). The human mutation sites are shown in plain text and the corresponding yeast residues in superscript. For clarity, only one of each pair of residues is labeled. (B) ISRIB-resistant mutants have reduced complex stability and are unresponsive to 200 nM ISRIB. Size-exclusion chromatograms of reconstituted WT and ISRIB-resistant eIF2B complexes in the presence of 300 mM NaCl. The elution positions of the (αβδγε)2 10mer and βδγε 4mer are indicated. (C) Quantification of eIF2B 10mer:4mer peak ratios from (A) (N = 2, mean ±SD). *p<0.05, **p<0.005, ***p<0.001, ns, not significant. Significance is shown for comparisons to WT within a condition (vehicle or ISRIB). Between conditions for a given construct, only WT was significant with p<0.05. (D) The GEF activity of ISRIB-resistant mutants is not enhanced by up to 500 nM ISRIB (550X WT EC50). ISRIB dose-response curves of GDP release half-life for WT, δL179F and δL487W 5mers. (E) ISRIB dose-response curves of GDP release half-life for WT and δL179F 4mer mixed with αV183F. Data from the WT 4mer + αWT is reproduced from Figure 2—figure supplement 1A as a dotted line for comparison. For (D) and (E), each point represents 9 measurements from three independent experiments (mean ± SD). We generated the δL487W mutation in the background of the eIF2B (αβδγε)2 decamer, as we were unable to purify it in a tetrameric form. As a control, we also generated δL179F, which was identified in an unbiased screen as an ISRIB-resistant mutant with wild-type activity (Sekine et al., 2015). First, we compared decamer stability of the wild-type and mutants by SEC on the purified αβδγε complexes. ISRIB supplementation increased the R10/4 of wild-type eIF2B from 8.6 to 15.5 (Figure 3B–C and Figure 2—figure supplement 2B). The δL487W mutation had a markedly reduced R10/4 of 1.6 (6X lower than wild-type) that did not change significantly in the presence of ISRIB, confirming that we had generated an ISRIB-resistant mutant. As expected, the δL179F also did not respond to ISRIB, although its R10/4 of 5.6 was closer to wild-type eIF2B (Figure 3B–C and Figure 2—figure supplement 2B). Like bona-fide VWMD mutations that destabilize the decameric complex, we expected δL487W to have impaired GEF activity. Consistent with the SEC data, the GEF activity of the δL487W mutant was severely compromised (25% of wild-type activity), whereas the activity of the δL179F mutant was similar to wild-type (Figure 3D) and both mutants were unresponsive to the addition of up to 500 nM ISRIB (550X wild-type EC50). Finally, we took advantage of a purified δL179F βδγε ISRIB-resistant tetramer, and combined it with the αV183F VWMD mutation. As expected, the combination of both mutations displayed not only compromised GEF activity which is driven by the αV183F mutation, but an inability to be rescued by ISRIB (Figure 3E). Thus, our examination of existing structural knowledge allowed us to generate a novel ISRIB-resistant mutant with VWMD-like complex stability and activity, which we contrasted against another ISRIB-resistant mutant with wild-type properties. The positive effects of ISRIB in vitro motivated us to generate a cellular model of VWMD, which would allow us to test its ability to rescue functional outputs of the ISR. We aimed to introduce mutations into an isogenic mammalian cell background in order to make direct comparisons between cell lines. We first isolated a monoclonal cell line from a previously described polyclonal HEK293T population containing an ISR reporter stably integrated at multiple genomic sites (Sidrauski et al., 2013). The ISR reporter drives firefly luciferase expression under control of the ATF4 5’ untranslated region (containing two uORFs). 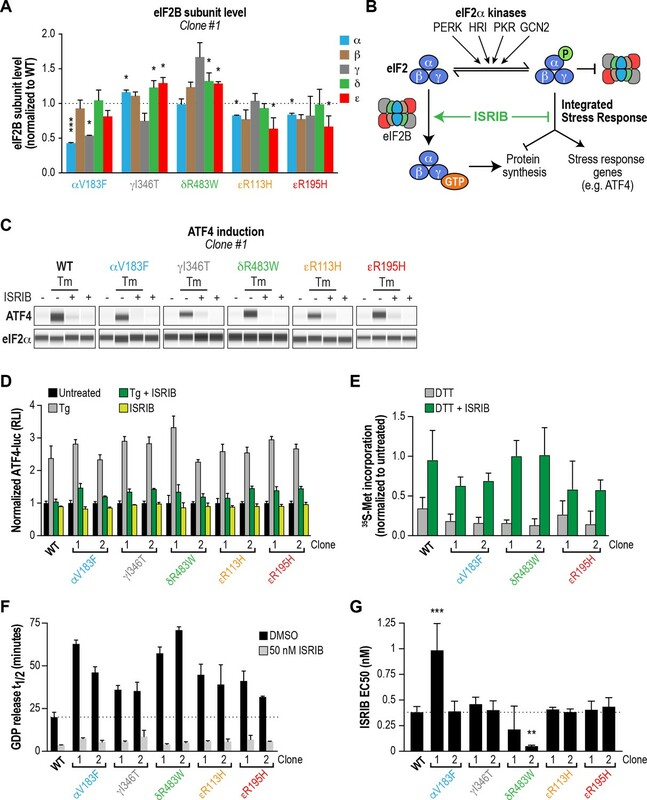 Like endogenous ATF4, translation of this reporter is driven by stress-induced eIF2α phosphorylation, which reduces ternary complex formation and results in translation initiation in the luciferase open reading frame (Sidrauski et al., 2013). We reasoned that this reporter would enable us to quantitatively measure ISR induction in cells carrying the various eIF2B VWMD mutations. Using the monoclonal parental ISR reporter cells, we generated daughter cell lines individually harboring the αV183F, δR483W, εR113H and εR195H mutations at their endogenous loci by CRISPR-Cas9 editing and homology-directed repair (Figure 4—figure supplement 1A). Despite repeated attempts, we were unable to produce cells with the εR136H mutation. As a substitute, we generated a ‘classical VWMD’ I346T mutation in the γ subunit, the second subunit of the catalytic subcomplex. For each VWMD mutation, we isolated and validated two independent clones. Due to the low efficiency of homology-directed repair and the hypotriploid nature of HEK293T cells (three copies of each eIF2B gene), we only obtained true homozygous VWMD mutations for αV183F (2 clones), δR483W (1 clone) and εR195H (1 clone). The remaining clones carried one or two VWMD alleles, with the remaining allele(s) disrupted by an out-of-frame indel leading to a premature stop codon (Supplementary file 1). Nevertheless, the VWMD allele is the only source of the affected subunit for all clones analyzed in this study. Thus, these cell lines do not suffer from the complication of residual wild-type eIF2B activity. Previous studies in both yeast and mammalian cells noted that a subset of VWMD mutations reduced levels of the affected subunit, and in some instances also destabilized associated subunits of the mutant complex (Richardson et al., 2004; Sekine et al., 2016; Wortham et al., 2016). We anticipated that decreasing subunit levels might further cripple the activity of VWMD mutant eIF2B, above and beyond the effects on decamer stability established above. To determine whether the generated VWMD mutations decrease the level of the various subunits, we performed immunoblotting of each eIF2B polypeptide in wild-type and VWMD mutant cells. The αV183F mutation caused a consistent 50% reduction in the level of the α subunit in both clones generated, whereas the γ subunit showed a 50% reduction in only one clone (Figure 4A; Figure 4—figure supplement 1B–C). The γI346T mutation caused a 20% reduction (that did not reach statistical significance) in γ subunit in one clone, and a significant 90% reduction in the second clone. Both the εR113H and εR195H mutations produced significant 20–40% reductions in ε subunit levels. One clone of εR195H also showed a 40% reduction in the α, β and δ regulatory subcomplex (Figure 4—figure supplement 1B). As noted in previous studies, VWMD mutations negatively affected the abundance of the mutated subunit, and in a subset of clones, the level of additional subunits was also reduced. Because both αV183F clones and one of the εR195H clones are homozygous mutants, the effect on protein levels cannot be explained solely by reduced gene dosage. The observed differences between clones carrying the same mutation could possibly be due to the intrinsic genomic instability of HEK293T cancer cells. In the subsequent experiments, we analyzed both clones of each VWMD mutation. ISRIB attenuates the ISR and rescues the GEF activity of eIF2B in HEK293T VWMD mutant cells. (A) Levels of the five eIF2B subunits were measured by immunoblotting (Wes analysis) of lysates from WT and VWMD cell lines. The chemiluminescence signal of each subunit was normalized to α-tubulin as a loading control and subsequently normalized again to WT subunit levels (N = 2, mean ± SD). The Wes image of one replicate is shown in Figure 4—figure supplement 1B. Quantification of a second clone of each mutant is shown in Figure 4—figure supplement 1C. Significance is shown for each subunit compared to WT; *p<0.05, ***p<0.001. (B) Schematic depicting the two outputs of the ISR: reduction in bulk protein synthesis and translational induction of ISR target genes. (C) ISRIB blocks ATF4 induction in VWMD mutants. Immunoblot analysis of endogenous ATF4 protein levels in WT and VWMD mutant cells. Total eIF2α was used as a loading control. Cells were treated with or without 1 μg/mL Tm and 500 nM ISRIB for 3 hr. A representative experiment is shown (N = 2). Similar results were observed in the second clone of each mutant (Figure 4—figure supplement 2A). (D) ISRIB attenuates Tg-evoked reporter activity in VWMD mutants. Relative luminescence values for the indicated cell lines treated with 100 nM Tg ± 500 nM ISRIB for 3 hr (N = 4, mean ± SD). The values were normalized to the signal of untreated control within each cell line. In every cell line, ISRIB significantly reduced the Tg-induced reporter signal (p<0.001). (E) ISRIB rescues 35S-methionine incorporation in both WT and VWMD mutants to a similar extent. Cells were treated with 2.5 mM DTT ± 500 nM ISRIB for 1 hr and pulsed with 35S-methionine 20 min prior to collection. Lysates were subjected to SDS-PAGE and quantification of radiolabeled methionine incorporation was done by gel densitometry in a Typhoon FLA scanner and normalized to that of untreated cells (N = 2, mean ± SD). Raw images used to quantify the lane intensities are shown in Figure 4—figure supplement 2D. (F) Half-lives of GDP release for WT and VWMD HEK293T lysates, calculated by fitting single-exponential decays to the Bodipy-FL-GDP fluorescence decay curves. All VWMD mutants had significantly reduced GEF activity (p<0.001) that is stimulated by ISRIB. (G) ISRIB EC50 values calculated from dose-response measurements in GEF assays (individual curves shown in Figure 4—figure supplement 4C). Significance is shown for comparisons of each mutant to WT; **p<0.005, ***p<0.001. For (F) and (G), each bar represents 9 measurements from three independent experiments (mean ± SD). Loss of eIF2B function is expected to produce a chronic ISR signal, and both VWMD patient-derived fibroblasts and post-mortem brain samples have markers of ISR induction (Kantor et al., 2005) (van der Voorn et al., 2005). Thus, we assumed that our cell lines with introduced VWMD mutations would exhibit a basal signature of ISR induction. To test this, we measured the two proximal outputs of the ISR: increased levels of ATF4 protein and attenuation of global protein synthesis (Figure 4B). First, we compared the level of endogenous ATF4 under steady-state, unstressed conditions. We did not detect significant basal ATF4 expression in any of the VWMD mutants (Figure 4C and Figure 4—figure supplement 2A, first lane in each panel), even in the mutants with reduced eIF2B subunit levels; two clones, δR483W clone #2 and εR113H clone #2, showed weak expression that was not reproducible. ATF4 induction is a highly sensitive readout of ISR activation, thus the lack of upregulation in the mutants was unexpected. Next, we measured 35S-methionine incorporation to determine the relative rates of protein synthesis in the various lines. Consistent with a lack of ATF4 upregulation, the basal rate of protein synthesis was similar in both VWMD and wild-type cell lines (Figure 4—figure supplement 2B–C). These data are consistent with prior reports showing that in two other systems, VWMD patient-derived lymphoblasts and engineered VWMD mutant CHO cells, the rate of protein synthesis was not reduced (Sekine et al., 2016; van Kollenburg et al., 2006a). We conclude that HEK293T VWMD mutants do not show significant ISR activation under basal conditions, suggesting that eIF2B activity is not limiting in this context. This is likely due to the high level of eIF2B expression in transformed cells (Figure 4—figure supplement 4A–B; Balachandran and Barber, 2004; Kim et al., 2000), which would mask the effects of VWMD mutations. Increased levels of eIF2B ensure that transformed cells can maintain high rates of protein synthesis for rapid proliferation. We wondered whether challenging cells with an exogenous stressor might reveal differences in ISR induction between wild-type and VWMD cells. To this end, we treated cells with tunicamycin (Tm), an inhibitor of protein N-glycosylation that triggers the ISR through activation of the PERK kinase. The level of endogenous ATF4 in wild-type and VWMD cells was significantly increased after 3 hr of Tm treatment (Figure 4C and Figure 4—figure supplement 2A, second lane in each panel). Importantly, co-treatment with 500 nM ISRIB fully suppressed the upregulation of ATF4 protein in wild-type as well as VWMD cell lines (Figure 4C and Figure 4—figure supplement 2A, third lane in each panel). This result demonstrates that even though we did not observe basal ISR induction under our growth conditions, ISRIB can suppress exogenous stress-induced ATF4 upregulation in cells expressing various eIF2B mutant subunits. In order to quantitatively compare the response of the different cell lines to ER stress, we took advantage of the genetically encoded ATF4-luciferase reporter. Cells were treated with varying concentrations of thapsigargin (Tg), an inhibitor of the sarco/endoplasmic reticulum Ca2+ ATPase, which disrupts ER calcium homeostasis and activates PERK kinase (Lytton et al., 1991). After 7 hr of treatment, wild-type cells showed a dose-dependent increase in ATF4-luciferase activity (EC50 = 14 nM; Figure 4—figure supplement 3). Surprisingly, all VWMD mutant cell lines showed a similar dose response, with no significant differences in Tg EC50. This implies that under our assay conditions, VWMD mutations that reduce eIF2B levels (and impair GEF activity in vitro) do not sensitize the cellular response to ER stress. As was the case for Tm, ISRIB prevented activation of the ATF4-luciferase reporter in cells treated with a saturating concentration of Tg, a severe ER stressor (Figure 4D). Finally, we tested whether ISRIB could rescue the reduction in protein synthesis in mutant cells after a stress challenge. We measured 35S-methionine incorporation following treatment with the ER stressor dithiothreitol (DTT), a reducing agent that causes rapid accumulation of unfolded proteins. After 1 hr of DTT treatment, we observed a reduction in 35S-methionine incorporation, with similar responses (~75% decrease) in wild-type and VWMD mutant cells (Figure 4E and Figure 4—figure supplement 2D). Co-treatment with ISRIB significantly restored 35S-methionine incorporation to a similar extent in both wild-type and VWMD mutant cells. Taken together, our results demonstrate that ISRIB engages VWMD mutant eIF2B in all tested cell lines and attenuates both cellular outputs of the ISR. VWMD mutant HEK293T cells did not exhibit basal ISR activation or increased sensitivity to exogenous ER stress. Given that three of the generated mutations (αV183F, δR483W and εR195H) had a detrimental effect on complex stability and GEF activity of recombinant eIF2B, we speculated that the lack of impairment of VWMD mutant cancer cells was due to high levels of eIF2B expression. Indeed, when we assessed the levels of each eIF2B subunit in a panel of five cell lines (HEK293T, HeLa, B-lymphocytes, WI-38 and hIPSCs), we discovered that HEK293T cells had the highest expression of every eIF2B subunit (Figure 4—figure supplement 4A–B). Our data are consistent with previous reports demonstrating overexpression of eIF2B subunits in transformed mammary epithelial cell lines (Balachandran and Barber, 2004; Kim et al., 2000), and is likely due to the selective advantage conferred by increased protein synthesis. Given this result, we postulated that conditions wherein the effective concentration of eIF2B is greatly reduced may reveal deficiencies in these mutants. We produced lysates from wild-type and VWMD mutant cell lines and compared their activities using the GEF assay (Figure 4F and Figure 4—figure supplement 4C). The >100X dilution of lysates relative to native cytosol placed the system in a regime wherein eIF2B activity became rate-limiting, finally revealing the deleterious nature of each VWMD mutation that was buffered by the high eIF2B levels found in cancer cells. αV183F lysates retained only 32–43% of wild-type activity. Lysates from both γI346T clones possessed 55% of wild-type activity. The observation that one clone had 80% of eIF2Bγ protein compared to wild-type whereas the second had only 10% (Figure 4A and Figure 4—figure supplement 1C), suggests that the quantity of eIF2Bγ is not limiting for eIF2B complex formation here. The severe disease mutation δR483W retained only 28–35% of wild-type activity. The two mutations in the catalytic subunit, εR113H and εR195H, had 44–51% and 48–63% of wild-type activity, respectively. Importantly, the reductions in activity for the mutants are consistent with data obtained from our fully reconstituted system. Our results represent the first comparison of the effects of VWMD mutations on GEF activity in an isogenic mammalian cell background. Finally, we tested the ability of ISRIB to rescue the deficiencies of the VWMD lysates in this assay. At 50 nM ISRIB, the t1/2 of GDP release with wild-type lysate was 3.6 mins, a 5.5X stimulation of activity (Figure 4F). Addition of ISRIB enhanced GEF activity to the point that all reactions containing VWMD lysates attained t1/2 < 9 mins. In the case of one of the δR483W clones, this translated to a dramatic 14X improvement in activity. Dose-response analysis showed that ISRIB had an in vitro EC50 = 0.38 nM in wild-type lysate (Figure 4G and Figure 4—figure supplement 4C). Moreover, the EC50 values for the VWMD lysates were similar to wild-type, with the notable exception of one αV183F clone (EC50 = 0.99 nM). As we observed in our reconstituted system, the two δR483W clones had lower ISRIB EC50 than wild-type (0.21 nM and 0.05 nM; see Discussion). This suggests that under the dilute protein concentrations used in this assay, the imbalance in the relative concentrations of the different eIF2B subunits did not dictate ISRIB sensitivity. Taken together, our results demonstrate that VWMD mutant cancer cell lines have impaired GEF activity that is revealed by dilution of the cellular lysate. Moreover, lysate GEF activity can be enhanced significantly, beyond basal wild-type levels, by the small molecule eIF2B activator ISRIB. Previous work demonstrated that many VWMD mutations lead to a partial reduction in GEF activity. Although the majority of these experiments measured the enzymatic activity of lysates derived from patient cells, a few were performed in yeast cells in which analogous mutations were generated in the highly conserved eIF2B complex (Richardson et al., 2004). Intriguingly, some pathogenic mutations have been reported not to affect the enzymatic activity of eIF2B. Liu et al. performed a comprehensive analysis of VWMD mutations using affinity-purified eIF2B derived from HEK293T cells overexpressing all the subunits of the complex, and concluded that GEF activity was not predictive of VWMD severity (Liu et al., 2011). Moreover, they reported that some severe mutations affected eIF2B function without obviously impairing recombinant complex integrity or enzymatic activity. By contrast, Fogli et al. measured the GEF activity of transformed lymphocyte lysates derived from 30 VWMD patients and reported a 20–70% decrease in activity in all mutated cells that correlated with age of disease onset (Fogli et al., 2004b). These contrasting conclusions underscore the need for further evaluation of the effect of VWMD mutations on eIF2B function. To this end, we interrogated the effect of pathogenic VWMD mutations in recombinant eIF2B complexes as well as in an isogenic cell model. The two complementary systems also served as the foundation to evaluate the ability of the eIF2B activator ISRIB to interact with the various VWMD mutant complexes and enhance their residual GEF activity. In enzymatic assays with both VWMD HEK293T cell lysates and purified recombinant eIF2B complexes, we observed compromised GEF activity in all generated mutants with the exception of εR136H. Importantly, we saw a correlation in GEF activity impairment for each specific mutant using eIF2B from the two different sources. δR483W and αV183F were the most crippling mutations in both assays. γI346T, εR113H and εR195H had similar but milder deleterious effects on GEF activity in cell lysates. In line with lysate measurements, recombinant εR195H eIF2B complexes also showed a milder defect in enzymatic activity than αV183F and δR483W. The EC50 of ISRIB for stimulating GEF activity was similar between wild-type and mutant complexes, except for δR483W (in both recombinant protein and cell lysates). Combined with our knowledge that no existing pathogenic mutations map to the putative ISRIB binding site within eIF2B, our data suggest that a broad range of VWMD mutations may be amenable to ISRIB-mediated rescue. Among our tested mutations, δR483W was the only one within the (βδ)2 regulatory core, and its position suggests that it could have potential effects on the stability of the βδγε subcomplex itself (Figure 2A). Although this is not apparent in the μM concentration range of our SEC experiments, they could manifest in the dilute nM regime of the GEF assay. We speculate that the ISRIB EC50 for this mutant is lowered because the compound is acting synergistically with eIF2Bα to rescue not just decamer formation but the stability of the tetramer itself. Future experiments using more sensitive methods to assay stability of the βδγε subcomplex at ultra-low concentrations could address this particular question. The degree of impairment of GEF activity in our in vitro assays and the reported severity of the disease allele in humans did not correlate. In particular, the two catalytic subunit mutants, εR113H (which has a classical disease presentation) and εR195H (which presents with a severe early phenotype), had similar lysate GEF activity. Thus, our reconstituted system can detect defects in eIF2B enzymatic function but does not capture true cellular complexity, such as factors that may modulate the activity of eIF2B in astrocytes or oligodendrocytes – the cell types most severely affected in the disease. Recombinant eIF2B complexes of the εR136H mutant had wild-type levels of activity and complex stability. We were unable to generate HEK293T cells carrying this mutation and thus could not measure the enzymatic activity of cell lysates. The GEF activity of cerebellar lysates prepared from mice carrying the analogous mutation showed a 23% reduction in activity, and no significant decrease in the level of the mutated subunit was observed (Geva et al., 2010). In this case, the purified mutant complex did not reveal the enzymatic defect that is observed in the relevant cell types. eIF2B has been reported to possess non-GEF activities, functioning as a guanine nucleotide dissociation inhibitor (GDI) displacement factor (Jennings et al., 2013), as well as directly regulating ternary complex formation (Jennings et al., 2017). Mutations that affect these functions will not be revealed in the standard GEF assay that measures release of GDP from pre-loaded recombinant eIF2. It is worth noting that the αβδ regulatory subcomplex is evolutionarily descended from an archaeal sugar-binding metabolic enzyme complex, ribose 1,5-biphosphate isomerase, and has been shown to retain its capacity to bind metabolites (Dholakia et al., 1986; Gross et al., 1988; Kuhle et al., 2015). This suggests that the absence or presence of metabolites could act as another layer of regulation on eIF2B function. VWMD mutations affecting any of these activities/regulators would not be detected in the minimal system represented by our GEF assay. We note that this class of mutations provide an ideal opportunity to further dissect eIF2B function in future experiments, without the complication of intrinsically impaired GEF activity. Mutations that destabilize the eIF2B decamer compromise GEF activity and may potentiate the disease phenotype. ISRIB binds at the eIF2B two-fold symmetric axis formed by (βδ)2, stabilizing and activating the complex. As eIF2B is essential for life, VWMD mutations can only partially cripple its activity. We hypothesized that regardless of the VWMD mutations introduced, ISRIB would be able to interact with the mutant complexes and enhance the residual GEF activity. Our data demonstrate that ISRIB can indeed interact with eIF2B complexes harboring pathogenic VWMD mutations. In cells, the activator can fully restore GEF activity and suppress induction of the ISR following ER stress and restore protein synthesis in five different mutant cell lines. Notably, ISRIB rescued decamer formation of all recombinant VWMD mutant eIF2B complexes that displayed a significant reduction in their decamer:tetramer ratio. This stabilization of mutant eIF2B by ISRIB resulted in restoration of GEF activity against its substrate eIF2 to wild-type levels. As predicted, incorporation of an ISRIB-resistant mutation, δL179F, prevented activation of a complex that contains the destabilizing αV183F mutation. The observation that ISRIB enhanced the activity of wild-type eIF2B in our cell-based assays suggests that even the wild-type complex can benefit from additional stabilization. We do not rule out the intriguing possibility that ISRIB may also have an allosteric stimulatory effect on the eIF2B complex, which is implied by our finding that ISRIB reduces the sensitivity of eIF2B to inhibition by phospho-eIF2 (Figure 1G). This result diverges from our previous observation that ISRIB does not alter the response of eIF2B to phospho-eIF2 (Sidrauski et al., 2015). However, our previous results were obtained using a high phospho-eIF2 concentration (~175 nM compared to 0–50 nM here) and lower eIF2B concentration (~0.5 nM compared to 1 nM here), conditions under which ISRIB is unlikely to have a rescuing effect. The effect of ISRIB on white matter astrocytes and oligodendrocytes, the most susceptible cell types in VWMD, must be investigated. Further experiments are also needed to understand the differential sensitivity of different cell types to VWMD mutations. Post-translational modifications and metabolites may modify eIF2B stability and activity in cells and these could vary significantly depending on cellular context. The intracellular concentration of eIF2B subcomplexes as well as the ratio of eIF2:eIF2B are likely also important, particularly since eIF2 can convert from a substrate to an inhibitor of eIF2B upon stress-induced phosphorylation. In conclusion, the ability of ISRIB to restore the GEF activity of eIF2B complexes containing VWMD mutations suggests that it may have beneficial effects in this neurodevelopmental leukodystrophy. More broadly, the finding that ISRIB can attenuate ISR activation in cells opens up avenues for use of this compound to ameliorate conditions wherein this crucial signaling pathway is inappropriately engaged. The HEK293T ATF4-luciferase reporter cell line was previously described (Sidrauski et al., 2013). A monoclonal population (isolated by single cell dilution) was used as the parental cell line for generating the VWMD knock-in mutations. Cells were maintained in DMEM High Glucose (Corning CellGro) supplemented with 10% FBS (Gibco) and 1X antibiotic-antimycotic solution (Gibco). eIF2B mutations were introduced into the HEK293T ATF4-luciferase reporter cell line using the GeneArt CRISPR Nuclease Vector with OFP Reporter Kit (Thermo Fisher). gRNA sequences (see Key Resources Table) were designed with MIT’s online CRISPR design tool (crispr.mit.edu), synthesized by IDT and inserted into the GeneArt plasmid according to manufacturer’s instructions. 150-base oligonucleotides were synthesized and used as DNA donor templates for homology-directed repair (HDR) after Cas9 cutting. The oligonucleotides were designed to include the point mutation of interest, as well as silent mutations to the gRNA PAM sequence to prevent Cas9 re-cutting. 1 μg of the guide-containing GeneArt plasmid and 10 μL of 50 μM HDR donor template were delivered into cells with a Lonza 4D-Nucleofector, using the SF reagent kit and program SF-130, according to vendor’s instructions. In some cases, cells were temporarily arrested at the G2/M transition by treatment with 20 ng/mL nocozadole for 16 hr before nucleofection to improve HDR efficiency. After 48–72 hr, OFP-positive cells were single-sorted into 96-well plates using a BD BioSciences FACSAria Fusion. Single clones were expanded and genomic DNA was extracted with a Quick-gDNA MiniPrep kit (Zymo Research). The eIF2B locus of interest was amplified by PCR and the purified PCR product was subjected to Sanger sequencing. Due to the low efficiency of HDR, this step typically yielded mixed sequences due to differential editing of the three eIF2B alleles in each clone. To disambiguate the editing events, PCR products were cloned into TOPO vectors using the TOPO-TA cloning kit (Thermo Fisher, Waltham, MA). TOPO clones were sequenced to ensure that we determined the identity of each of the three alleles (Supplementary file 1). Cell line identities were verified by ATCC STR profiling and have been tested to be free of mycoplasma contamination. One day prior to treatment, cells were seeded into 96-well white opaque plates (Falcon) at a density of 4 × 104 cells/well in 100 μL medium/well. Thapsigargin (1 mM stock concentration in DMSO) was dispensed into wells using a Tecan D300e digital dispenser, and incubated at 37°C for the specified time. ONE-Glo luciferase assay reagent (Promega) was added to each well following manufacturer’s instructions and incubated for 5 min at room temperature. Luminescence was measured on a Molecular Devices SpectraMax i3x plate reader. One day prior to the assay, cells were seeded into 12-well tissue culture plates coated with 10 mg/mL poly-D-lysine (Sigma) at a density of 5 × 106 cells/mL. On the day of the assay, cells were treated with the indicated concentrations of DTT and ISRIB, and incubated for 40 min. 20 μCi of EasyTag L-[35S]-methionine (Perkin Elmer) was added to each well and the plate was incubated for an additional 20 min. Cells were washed with PBS and lysed by addition of 0.2 mL RIPA buffer supplemented with protease and phosphatase inhibitor cocktail (Pierce). For measurement of 35S-methionine incorporation by gel quantitation, 20 μL of each lysate was run on a 10% SDS-PAGE gel (Bio-Rad). Gels were fixed in 40% methanol/10% acetic acid, stained with Bio-Rad QC Colloidal Coomassie solution, rinsed and dried. Dried gels were exposed to a storage phosphor screen (GE Healthcare) for 1–2 days. The phosphor screen was imaged on a Typhoon FLA scanner (GE Healthcare). For each lane of the phosphor and Coomassie images, areas and mean pixel intensities were quantified using ImageJ (NIH.gov). Sequences of full-length human eIF2B subunits (UniProt accession numbers: eIF2Bα, Q14232; eIF2Bβ, P49770; eIF2Bγ, Q9UI10; eIF2Bδ, Q9NR50; eIF2Bε, Q13144) and human eIF2 subunits (UniProt accession numbers: eIF2S1, P05198; eIF2S2, P20042; eIF2S3, P41091) were synthesized by GenScript with or without an N-terminal FLAG-TEV tag, and cloned into a modified pHybE vector for expression (Hsieh, 2012). Point mutations were introduced into subunits by site-directed mutagenesis. Proteins were expressed in HEK293-6E cells (NRC-Canada) using a Wave Bioreactor System 20/50EHT (GE Healthcare). Cells were grown to a density of 1.2 × 106 cells/mL in Freestyle 293 expression media (Thermo Fisher) supplemented with 0.05% Pluronic-F68 (Thermo Fisher) and 0.5% Penicillin-Streptomycin (Thermo Fisher). Cells were transfected with expression plasmid DNA at 0.5 mg/L mixed with 1 mg/mL polyethylenimine (PolySciences Inc.) in a 1:4 ratio for 10 min, and grown at 37°C with 8% CO2 for 3 days. All purification steps were performed at 4°C. Cell pellets were resuspended in buffer A (20 mM HEPES, 300 mM KCl, pH 7.4) and lysed in a French Press (Aminco). Post-lysis, 1 mM EDTA and a standard protease inhibitor cocktail that omitted AEBSF but included PMSF were added to the supernatant. Protein complexes were purified by FLAG affinity chromatography (Domanski et al., 2012) using buffer A + 1 mM EDTA. Pooled fractions were dialyzed overnight against buffer A + 1 mM EDTA and 0.5 mM TCEP. eIF2 was further purified on a TSKgel SuperQ-5PW anion-exchange column (50 mL bed volume; Tosoh Biosciences) using 50 mM HEPES, 1 mM MgCl2, 50–500 mM KCl salt gradient, 8.0–7.2 pH gradient. Protein concentrations were determined by Bradford assay. For verification of protein complex sizes by multi-angle light scattering, 100 μL of each undiluted purified sample (concentrations ranged from 0.55 to 0.75 mg/mL) was loaded onto a WTC-030S5 column (Wyatt Technology) by auto-injection from a 1260 Infinity II HPLC system (Agilent Technologies). The column was connected in-line to a Dawn HELIOS II system (Wyatt Technology). The system was run at 0.3 mL/min for 1 hr using 20 mM HEPES, 200 mM KCl, 5 mM MgCl2, 1 mM TCEP, pH 7.4 as the mobile phase. Protein concentrations for molecular weight calculations were determined by UV280 absorbance. For loading of eIF2 with fluorescent nucleotide, 500 μL of eIF2 at 4.9 mg/mL (38 μM) was adjusted to a final concentration of 5 mM EDTA. Bodipy-FL-GDP (Thermo Fisher #G22360) was added to a 5-fold molar excess over eIF2 and the mixture was incubated for 1 hr at room temperature. MgCl2 was added to a final concentration of 10 mM to quench the loading reaction. The mixture was buffer-exchanged by loading onto an Illustra NAP-5 column (GE Healthcare) equilibrated with 20 mM HEPES, 120 mM KCl, 10 mM MgCl2, 1 mM TCEP, pH 7.4. Loaded eIF2 was eluted with 1 mL buffer, aliquoted and stored at −80°C until use. For phosphorylation of eIF2, 150 μL of eIF2 at 1.5 μM was incubated with 500 μM ATP and 100 nM PERK kinase (Thermo Fisher #PV5106) for 2 hr at room temperature. The mixture was buffer-exchanged by loading onto a PD Spintrap G-25 column (GE Healthcare) equilibrated with 20 mM HEPES, 120 mM KCl, 5 mM MgCl2, 1 mM TCEP, pH 7.4. Phosphorylated eIF2 was eluted with 0.6 mL buffer, aliquoted and stored at −80°C until use. Wild-type and VWMD HEK293T cells were grown to approximately 80% confluence in 4 × 15 cm tissue culture dishes per cell line. Cells were harvested in PBS by pipetting and centrifuged to pellet. Each cell pellet was resuspended in 0.8 mL 20 mM HEPES, 150 mM KCl, 2 mM TCEP, pH 7.4 + cOmpleteTM EDTA-Free protease inhibitor cocktail (Roche). Cells were lysed by manually passing them through a tungsten carbide ball-bearing homogenizer (isobiotec) with an 8 μm clearance. Lysed samples were cleared by centrifugation at 48,000 x g for 15 min at 4°C. Cleared lysates were aliquoted and stored at −80°C until use. Wild-type and VWMD HEK293T lysates were normalized to a protein concentration of 0.2 mg/mL by BCA assay. Samples were run on a ProteinSimple Wes capillary system using a 12–230 kDa separation module and the following instrument parameters: run conditions = 375V, 25 min; antibody diluent time = 5 min; primary and secondary antibody incubation time = 30 min. All antibodies were used at a dilution of 1:50 except for eIF2Bγ (1:25 dilution) and eIF2α (1:100 dilution). Bodipy-FL-GDP-loaded eIF2 was adjusted to 1 μM using assay buffer (20 mM HEPES, 120 mM KCl, 5 mM MgCl2, 1 mM TCEP, pH 7.4). A mixture of 50 nM eIF2 +1 mg/mL BSA was prepared in assay buffer and loaded into the injection module of a Molecular Devices SpectraMax i3x plate reader. 2X mixtures were prepared in assay buffer for the following experiments: HEK293T lysate assay = 0.2 mM GDP, 1 mg/mL BSA, 10 nM phospho-eIF2, 0.6 mg/mL lysate; recombinant eIF2B assay = 0.2 mM GDP, 1 mg/mL BSA, 10 nM phospho-eIF2, 6 nM eIF2B 4mer + α subunit (or 2 nM eIF2B 5mer); α titration assay = 0.2 mM GDP, 1 mg/mL BSA, 10 nM phospho-eIF2, 10 nM eIF2B 4mer, 0–1 μM α subunit; phospho-eIF2 titration assay = 0.2 mM GDP, 1 mg/mL BSA, 2 nM eIF2B 5mer, phospho-eIF2 and ‘cold’ eIF2 in varying ratios with a total concentration of 100 nM. In all experiments, 5 μL of each mixture was pipetted into the wells of a 384-well black low-volume plate (Greiner Bio-One #784076). For ISRIB dose-response studies, ISRIB was dispensed from a 25 μM or 250 μM stock using a Tecan D300e digital dispenser into wells containing the mixtures above. DMSO was used for normalization in order to maintain a concentration of 0.2% in all wells in the final assay volume. For each run, triplicate measurements were made for each concentration of ISRIB. Reactions were read on the Spectramax plate reader using the following instrument parameters: plate temperature = 25°C; eIF2 injection = 5 μL per well; shake before read = 2 s low intensity; PMT sensitivity = high; flashes/read = 6; excitation wavelength = 485 nm (15 nm width); emission wavelength = 535 nm (25 nm width); read duration = 30 min at 45 s intervals. In a final assay volume of 10 μL/well, the following conditions were kept constant: 25 nM Bodipy-FL-GDP-loaded eIF2, 0.1 mM GDP, 1 mg/mL BSA. Phospho-eIF2, ISRIB and eIF2B varied depending on the experiment. To calculate GDP release half-lives, single-exponential decays were fit to the raw fluorescence intensity data using Prism (GraphPad Software). Purified proteins were thawed and centrifuged at 20,000 x g for 10 min at 4°C to remove any potential aggregates. For 5mer runs, proteins were normalized to 1 μM prior to column loading. For 4mer + α runs, the 4mer was normalized to 1 μM and the α subunit was normalized to 1.2 μM. 100 μL of each sample was injected onto a Superose 6 10/300 column connected to an AKTA Pure 25 FPLC system (both from GE Healthcare). The system was run at 0.4 mL/min for 1 hr using 20 mM HEPES, 300 mM NaCl, 2 mM MgCl2, 1 mM TCEP, pH 7.4 as the mobile phase. For conditions with ISRIB, the protein samples and mobile phase were supplemented with 200 nM ISRIB. Data was processed in Prism (GraphPad Software). One- or two-way ANOVA with Fisher’s LSD was used for significance testing between different samples. Journal of Neuropathology & Experimental Neurology 70:69–82. Journal of Clinical Investigation 126:1512–1524. European Journal of Human Genetics 12:561–566. The Journal of Biological Chemistry 263:12486–12492. Cold Spring Harbor Perspectives in Biology 4:a011544. U.S. Patent and Trademark Office. Unites States. Molecular and Cellular Biology 21:5018–5030. Molecular and Cellular Biology 24:3295–3306. The Journal of Biological Chemistry 266:17067–17071. Journal of Biological Chemistry 285:31944–31953. The Journal of Biological Chemistry 258:7928–7934. Molecular and Cellular Biology 24:2352–2363. Journal of Neuropathology & Experimental Neurology 64:770–775. Journal of Neuropathology and Experimental Neurology 65:707–715. Journal of Biological Chemistry 276:24697–24703. Molecular and Cellular Biology 16:6603–6616. Thank you for submitting your article "The small molecule ISRIB rescues the stability and activity of Vanishing White Matter Disease eIF2B mutant complexes" for consideration by eLife. Your article has been favorably evaluated by Randy Schekman (Senior Editor) and three reviewers, one of whom, Alan Hinnebusch, is a member of our Board of Reviewing Editors. The reviewers have opted to remain anonymous. In this study, the authors have reconstituted WT and VWM eIF2B heterodecameric complexes from purified tetramers and α-α homodimers, and shown that 3 of 4 VWM substitutions examined reduce GEF activity and can be rescued to WT basal activity (i.e. in absence of ISRIB) by addition of ISRIB. They also show that the α-α homodimer can stimulate the GEF activity of the eIF2B tetramer formed with the other 4 eIF2B subunits. In the case of the α-subunit mutation V183F, located at the α-α interface, elevated concentrations of the mutant subunit were required to observe its stimulatory effect on the GEF activity of the tetramer, and at a concentration of this α variant where half-maximal stimulation of GEF activity was achieved, ISRIB could stimulate the activity further to achieve the WT basal level. Using gel filtration (SEC), they then showed that 3 of the 4 mutants impair decamer formation at an elevated salt concentration chosen to slightly destabilize the WT decamer, although the effect of R195H is marginal; and demonstrated that ISRIB can rescue stable heteropentamer formation for all 3 variants, in parallel with rescuing their GEF activities. They went on to examine a site-directed substitution in the δ subunit, L487W, predicted to perturb the δ-β interface and also the predicted ISRIB binding pocket, finding that it destabilizes the heteropentamer and reduces GEF activity in a manner that cannot be rescued by ISRIB. 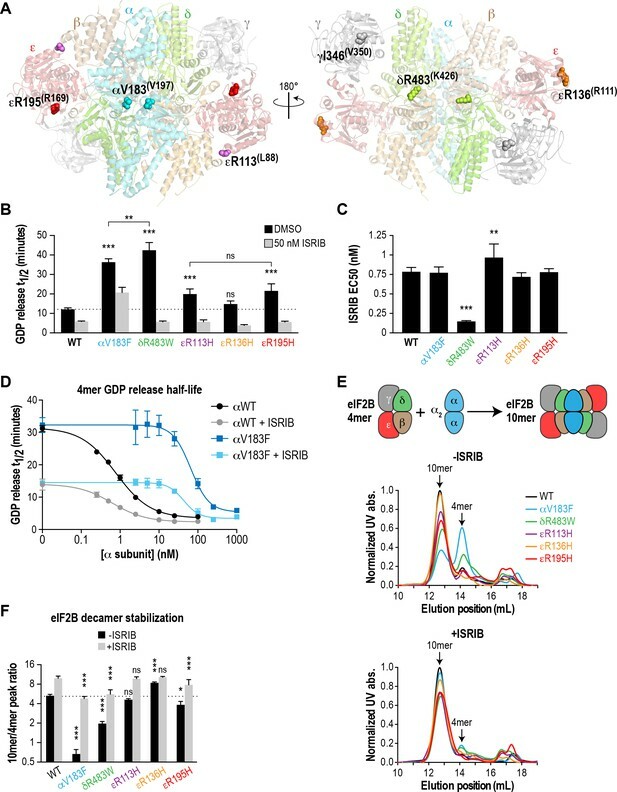 These findings provide direct evidence that heteropentamer formation is required for robust eIF2B activity, and that ISRIB enhances GEF activity by restoring heteropentamer formation. Consistent with these findings, they also showed that combining the α-subunit V183F VWM substitution with a previously described δL179F substitution, which confers resistance to the stimulatory effect of ISRIB without affecting GEF activity, yields a reconstituted double mutant complex with greatly impaired activity that cannot be rescued by ISRIB at all. The authors went on to use gene-editing to generate isogenic cell lines derived from transformed HEK293T cells containing five different VWM mutations as the only source of the relevant eIF2B subunit; some of which reduced the levels of the mutated subunit, or one or more other eIF2B subunits. Surprisingly, despite the strong effects of V183F and R483W on heteropentamer formation and eIF2B activity in vitro, neither of these substitutions, nor any of the other 3 tested, induced ATF4 expression or reduce 35S-Met incorporation in non-stressed cells. Even in response to tunicamycin or Thapsigargin (Tg), which activate PERK, the VWM substitutions did not increase induction of endogenous ATF4 protein. And using the ATF4-LUC reporter, none of the mutations conferred increased reporter expression at Tg concentrations below the EC50 for reporter induction in the WT cells. Similar results were obtained using two different concentrations of DTT and measuring 35S-Met incorporation. Thus, the VWM mutations do not sensitize the cellular response to ER stress, which the authors attribute to elevated eIF2B levels in these transformed cells. However, for all mutants tested, ISRIB can suppress the induction of ATF4 protein, ATF4-LUC expression and reduced 35S-Met incorporation. They were able to recapitulate the deleterious effects of the three VWM substitutions also examined with recombinant complexes, and two others, on GEF activity when the cell lysates employed in the assays were highly diluted, and again, the reductions in GEF activity were completely rescued by ISRIB. The two VWM substitutions that reduced GEF activity the most using recombinant complexes (V183F and R483W), also reduced GEF activity in the cell lysates more so than the third (R195H). However, considering the results for all five mutants examined in lysates, they find that the extents of the GEF defects do not correlate with the severity of the disease, at least when equating age of onset with disease severity. 1) As a follow up to Figure 1E, document the extent of holocomplex formation achieved on mixing WT tetramers and α2 dimers. 2) Provide a rigorous statistical analysis of differences in GEF activity and holocomplex assembly for the different mutant complexes and adjust conclusions accordingly. 3) Conduct experiments to determine whether ISRIB increases the GEF activity of the tetramer by enhancing octamer formation. 4) Resolve discrepancies between the two panels of Figure 2D regarding GEF activity of the tetramer, clearly shown on the left panel but seemingly contradicted by the right panel. 5) Improve Figures 2E/3A by showing western blots of fractions from the size exclusion chromatography experiments. 6) Quantify the ATF4 protein expression for the experiments shown in Figure 4C/Figure 4—figure supplement 2A, and discuss any differences that might exist among the mutants. 7) Examine the GEF activity of the recombinant R113H mutant complex, which has been analyzed in all previous studies on VWM mutant complexes. 8) Measure eIF2B expression levels in HEK cells to determine if they truly are elevated compared to untransformed cells. 9) Discuss the physiological relevance of using high salt to measure effects of VWM mutations on complex formation; and possibly refrain from inferences that the in vivo defects conferred by V183F or R483W arise from weaker heteropentamer assembly. 10) Re-think the interpretation of the lower ISRIB EC50 for the R483W variant, which doesn't seem to make sense. 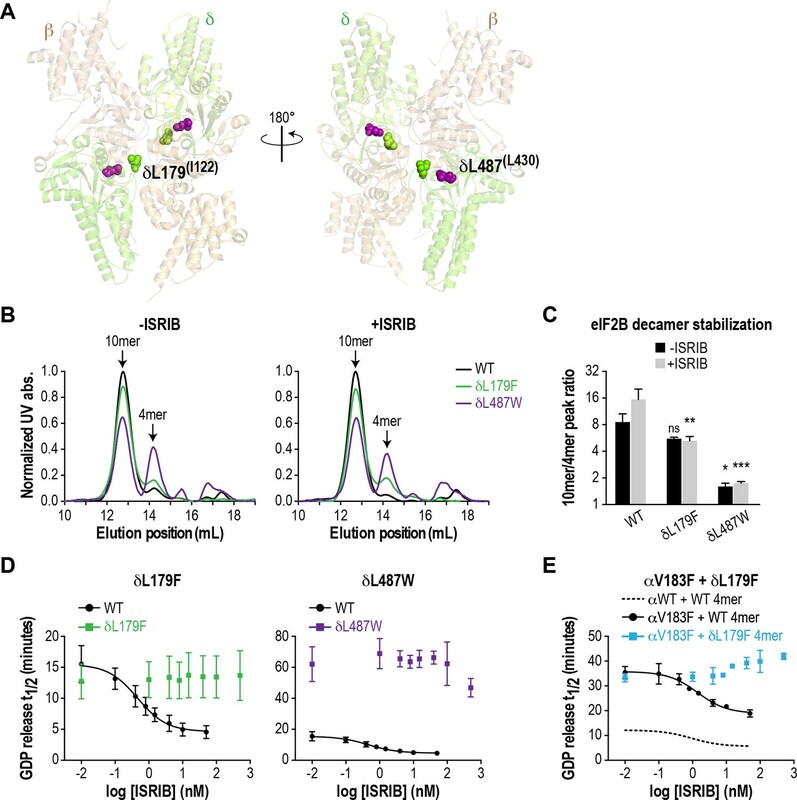 The results are significant in providing direct evidence that heteropentamer formation is critical for robust eIF2B activity in vitro, and underlies the stimulatory effect of the α-α homodimer on GEF activity of the tetramer formed by the other four eIF2B subunits; and that ISRIB rescues GEF activity by promoting heteropentamer formation. The results are also significant in showing that the deleterious effects of 6 different VWM mutations on GEF activity can be rescued to WT levels by ISRIB. The findings that the age of disease onset does not correlate with the severity of the defect in GEF activity for either recombinant complexes or eIF2B complexes in cell lysates represents a rigorous set of results that are germane to this controversial aspect of VWM. Their finding that none of the VWM substitutions generated in HEK cells by gene editing induce the ISR in the absence of stress, nor exacerbate it when PERK is activated, was surprising and might reflect the abnormally high eIF2B levels in the transformed HEK cells. While this is a disappointing aspect of the study, it does not prevent them from showing that ISRIB can rescue eIF2B activity in cell lysates for all 5 VWM mutants tested. 1) MALS analysis should be done on the mixture of WT 4-mer and α2 dimers to show the yield of 10-mer achieved in the reconstitutions analyzed in Figure 1. 2) Subsection “Correlation between eIF2B GEF activity and disease severity of VWMD mutants”, third paragraph, the claim that R483W is more crippling than V183F in assays of both recombinant eIF2B and in cell lysates is not compelling, as there is no demonstration that these differences are statistically significant. It's also unclear whether the activity of R113H in lysates is significantly higher than that of V183F because the variance between the two V183F replicate cell lines is quite large. These interpretations may have to be withdrawn. 3) The statement that "A key finding of our work is that the catalytic activity of recombinant eIF2B is proportional to the stability of the decameric holoenzyme." is an overstatement, as L487W has a smaller effect on decamer stability but a greater effect on activity vs. V183F. What they can say is that several mutations with strong effects on decamer stability also have strong effects on activity, and both defects are co-rescued by ISRIB. This manuscript reports the investigation of the effects of a compound ISRIB on eIF2B activity and regulation. It confirms prior studies that show that ISRIB can stimulate eIF2B activity and promote/stabilize decamer formation. It extends these findings to examine the impact of CACH/VWM disease mutations on eIF2B activities using purified proteins and in CRISPR/cas9 engineered HEK293T cells. ISRIB enhances the activity of all eIF2B mutants tested, except for a mutation in the predicted ISRIB-binding pocket. The authors propose that ISRIB stabilises decameric eIF2B that by an unknown mechanism boosts its GEF function and this occurs with all VWM mutations tested here. As ISRIB was previously shown to cross the blood-brain barrier it has potential to correct eIF2B function in glial cells sensitive to eIF2B mutations, but this was not addressed in this study. In general the work appears to have been performed to a high standard, however there are some issues relating to how the experiments are described and presented that should be addressed. In general this study agrees with many prior analyses of VWM alleles in that studies of purified mutant eIF2B can reveal defects, when some cell-based assays do not, and vice versa. The main novel features of this study are the use of CRISPR to make cells lines and the evaluation of ISRIB as a potential curative agent. The conclusions could be strengthened by some additional experiments, which the authors have resources in place to complete. 1) Figure 2D. Left panel. This figure appears to show that in the absence of eIF2Bα, ISRIB can still stimulate 4-mer GEF activity. Reactions without eIF2Bα are not shown, but were presumably done? The lowest point is 0.01M eIF2Bα, meaning that almost all eIF2B lacks eIF2Bα, but its activity is still boosted by ISRIB. This is not discussed in the manuscript. How does ISRIB boost 4-mer activity? Does it stabilize octamer formation in the absence of eIF2Bα? Or does ISRIB boost GEF activity via a different mechanism? Performing size exclusion chromatography of the 4mer alone +/- ISRIB would allow evaluation of the first mechanism. It was shown previously that, unlike the mammalian complexes studied here, the yeast eIF2B complex octamer lacking eIF2Bα is stable (see Gordiyenko et al. PMID:24852487). 2) Figure 2D. Similarly there is evidence that both yeast and mammalian eIF2B complexes lacking eIF2Bα are less sensitive to eIF2 phosphorylation, (e.g. Elsby et al. PMID:21795329; Kimball et al. PMID:9582312 for mammalian references). By performing an experiment analogous to the one shown in Figure 1G, with 4mer eIF2B +/- ISRIB and V183F +/- ISRIB, the impact of loss of eIF2Bα on sensitivity to the ISR and ISRIB could be assessed. This would enable a comparison of the effects of phospho-eIF2 between purified V183F which has a significant 4mer form (Figure 2E) and the 293 cell data in Figure 4. 3) Figure 2D right panel. This presentation is not clear. The plots appear to intersect through 0,0 where the axes meet. This would indicate that the 4mer protein is inactive, which it is not. It be simply that the graph title and legend require changing to indicate what is actually being shown here. 4) Figures 2E/3A would be improved by showing example western blots of fractions from the size exclusion chromatography. This should demonstrate that eIF2Bα is absent from the 4mer fraction and may indicate what is present in the low molecular weight fractions. The panels could be presented as a figure supplement. 5) Figure 3 and discussion in subsection “Correlation between eIF2B GEF activity and disease severity of VWMD mutants”. If the authors have the ability to generate labelled ISRIB, they could determine if its affinity for eIF2B is altered by L487W as they suggest, or is altered for the 4mer vs. 10mer forms. 6) Figure 4C/Figure 4—figure supplement 2A and text p8 paras 3/4. Figure 4—figure supplement 2A shows that some mutants do have higher ATF4 levels. This is not indicated in the text. 7) Figure 4D. This figure does not show data for untreated cells. From the data shown in Figure 4—figure supplement 3, it appears the presentation of 4D is over-normalised and therefore does not show clearly where there is any differences in the eIF2B mutant responses to Tg treatment, only responses to ISRIB. By presenting the data differently more information would be clearer. 1) As noted by the authors, some studies suggest that there might be a correlation between eIF2B GEF activity and age of onset in VWMD (e.g. the Fogli and Horzinski references in the present manuscript) whereas other found no association (e.g. the Liu and van Kollenburg references). Based on these discrepancies the authors logically say that further work is needed to clarify the relationship between GEF activity and VWMD. It is therefore surprising that, other than the δR483W mutant, they did not assess the activity of other mutants assessed in previous studies. For example, the four previous studies that are referenced in this paper all showed that the activity of the εR113H mutant was lower than the wild type protein. In the present study, the assembly of that mutant into the holocomplex was examined, but not its GEF activity. The previous studies showed that other homozygous mutants, e.g. εP243L and βE213G, had lower GEF activity compared to wild type. The authors should confirm that their assay replicates the findings previously reported for at least one or two more mutants. 2) In several of the analyses, the assay conditions had to be modified in order to see differences, e.g. increasing the NaCl concentration to 300mM when assessing complex formation and including phosphorylated eIF2 in the GEF assays. Do the authors have any idea whether such conditions might, or might not, reflect complex formation or GEF activity in vivo? In other words, would the difference in formation or activity in an intact cell be large enough to be physiologically relevant? 3) Subsection “Several VWMD mutations reduce the protein level of the affected subunit in cells”, last paragraph. – What epitope on the α subunit does the anti-eIF2Bα antibody recognize? If it is near V183, could the apparent reduction in α content be due to altered antibody affinity for the protein, rather than an actual decrease in the amount of protein expressed? 4) As noted by the authors, the relative expression of eIF2Bε is increased in some transformed cells compared to non-transformed cells. Do the HEK293T cells used in this study express high levels of eIF2Bε? If so, why were they used for this study rather than a cell line that has lower relative expression? 5) – The authors speculate that "the basal activity of the δR483W mutant is so compromised that ISRIB-stimulated formation of even minimal levels of decamer have a drastic effect on GEF activity". However, the αV183F mutant has similarly low GEF activity (Figure 2B) and ISRIB caused a dramatic increase in formation of the decamer. Yet, the magnitude of the difference in GEF activity in the presence and absence of ISRIB is much lower than for the δR483W mutant. Please explain. Thank you for submitting your article "The small molecule ISRIB rescues the stability and activity of Vanishing White Matter Disease eIF2B mutant complexes" for consideration by eLife. Your article has been evaluated by the Reviewing Editor Alan Hinnebusch and Randy Schekman as the Senior Editor. The manuscript was judged to be much improved by the addition of new data and revisions of text. There are however a few issues that should be addressed prior to publication, as follows. - In the statement in the fourth paragraph of the subsection “Recombinant eIF2B with VWMD mutations exhibit impaired GEF activity that is rescued by ISRIB” that the activity of the tetramer is <30% of the decamer and stimulated 2.2X by ISRIB, it is unclear how these values were calculated from the data in Figure 2D; and this needs to be made transparent. - In the second paragraph of the subsection “Recombinant eIF2B with VWMD mutations exhibit reduced decamer stability that is rescued by ISRIB”, they did not cite Figure 2E or Figure 2—figure supplement 2 for the results on any of the mutants in the absence of ISRIB; but should do so. - Subsection “Recombinant eIF2B with VWMD mutations exhibit reduced decamer stability that is rescued by ISRIB”, last paragraph, first sentence: the word "presumably" should be added, as this is an interpretation, even if a plausible one. - Subsection “ISRIB attenuates ISR induction in all VWMD cell lines”, third paragraph: It appears that even this statement about levels of ATF4 protein induction "being qualitatively similar" is not justified, as the Western results for ATF4 protein in WT versus mutant extracts are contained on different gels/blots and thus cannot be compared – as they indicated in their rebuttal. They would have to conduct a Western blot of a gel containing extracts from mutants and WT analyzed side by side. Otherwise, remove/modify the statement. - A loading control, or image of Ponceau S staining, is required to ensure equal loading of extracts for the new Figure 4—figure supplement 4. Done, and included in Figure 1E. Statistical analyses have been performed as requested. Figure panels and text have been updated accordingly. Our conclusions for the activity of each mutant remain unchanged. We performed SEC runs on the tetramer in the absence and presence of ISRIB to show that this is indeed the case. The new data are presented as Figure 2—figure supplement 1B. Furthermore, this finding is consistent with two new cryo-EM structures of eIF2B reported by the groups of Peter Walter (https://www.biorxiv.org/content/early/2017/11/24/222257; doi: 10.1101/222257) and David Ron (https://www.biorxiv.org/content/early/2017/11/25/224824; doi: 10.1101/224824). In particular, the Walter group solved a structure of an ISRIB-stabilized octamer in the absence of eIF2Bα and further validated their finding using analytical ultracentrifugation of the complex, which is orthogonal to our method. In the right panel of Figure 2D, we background-subtracted the activity of tetramer alone in order to calculate the Km of the eIF2Bα subunits. Thus, it appeared as if the tetramer had zero activity. We have updated the graph title and figure legend to clarify, and moved the panel to Figure 2—figure supplement 1 to make Figure 2 more clear. We performed the Western blots of the fractions as requested, probing for the δ subunit (representing the 4mer subcomplex) and the α subunit. The data are consistent with the UV chromatograms in Figure 2E/3A, albeit less sensitive due to the poorer resolution of elution volume. We have presented the data as Figure 2—figure supplement 2. We previously attempted to quantify basal ATF4 levels, but this was not feasible due to the very low expression of the protein in unstressed HEK293T cells. Across replicate experiments, we have not observed consistently different basal ATF4 levels between WT and the various mutants, as we pointed out in the text. Thus, we chose to restrict ourselves to only qualitative comparisons for the experiment in those panels Note that the panels of WT and mutants should not be compared to each other, but only to treatments within each cell line (hence the separate boxes for each cell line). In fact, the apparent higher ATF4 levels in two of the mutant clones (δR483W #2 and εR113H #2 in Figure 4—figure supplement 2A) is due to increased exposure time to account for lower induction of ATF4 upon Tm treatment, for unknown clone-specific reasons. We measured the GEF activity and holocomplex formation of the recombinant εR113H mutant, and incorporated the data into revised panels in Figure 2. We found that this mutant has activity that is significantly reduced compared to WT and comparable to the εR195H mutant. We measured eIF2B subunit levels in a panel of five cell lines and discovered that HEK293T cells do indeed have significantly elevated levels, even in comparison to another transformed cell line (HeLa). The data are presented in a new panel (Figure 4—figure supplement 4A). We have discussed this point in detail in our response to reviewer 3 below. While the high salt is obviously not reflective of physiological conditions, the highly artificial nature of the SEC assay (high concentration of purified protein, no other macromolecules, non-equilibrium conditions) already make it difficult to compare to conditions in vivo. Ultimately, however, we do believe that the differences revealed in our assay are reflective of physiologically relevant changes caused by the different mutations. Nevertheless, we altered the text in the manuscript slightly to make it clear that we used non-physiological conditions to increase the dynamic range of the assay. We have included new text in the Discussion to elaborate on this topic, and made clear that our interpretation is a postulation. As such, we do not emphasize this point. However, we believe that our reasoning is sound. We elaborate further on this in the response to reviewer 1 below. We found that the difference in GEF activity between recombinant R483W and V183F is highly statistically significant. However, in cell lysates (when combining both clones of each mutant), the R483W and V183F mutants were not statistically significant (p = 0.08). Therefore, we removed the text stating that R483W was more crippling than V183F in both systems. The difference between R113H and V183F cell lysates is statistically significant, thus that part of our conclusions is unchanged. We removed the sentence, as suggested by the reviewer. […] In general the work appears to have been performed to a high standard, however there are some issues relating to how the experiments are described and presented that should be addressed. In general this study agrees with many prior analyses of VWM alleles in that studies of purified mutant eIF2B can reveal defects, when some cell-based assays do not, and vice versa. The main novel features of this study are the use of CRISPR to make cells lines and the evaluation of ISRIB as a potential curative agent. The conclusions could be strengthened by some additional experiments, which the authors have resources in place to complete. The x-axis of the graph was mislabeled due to plotting on a log scale. The lowest point was actually 4-mer in the absence of any a subunit. The error has been corrected. As the reviewer inferred, ISRIB does indeed boost the activity of 4-mer alone (see point below). We performed SEC runs on the tetramer in the absence and presence of ISRIB to show that it stabilizes octamer formation, as the reviewer suspected. The new data are presented as Figure 2—figure supplement 1B. Furthermore, this finding is consistent with two new cryo-EM structures of eIF2B reported by the groups of Peter Walter (https://www.biorxiv.org/content/early/2017/11/24/222257; doi: 10.1101/222257) and David Ron (https://www.biorxiv.org/content/early/2017/11/25/224824; doi: 10.1101/224824). In particular, the Walter group solved a structure of an ISRIB-stabilized octamer in the absence of eIF2Bα and further validated their finding using analytical ultracentrifugation of the complex, which is orthogonal to our method. We speculate that the stability of the yeast eIF2B octamer may explain why eIF2Bα is dispensable for viability in that organism – it is not required to “activate” the complex. Our data in Figure 2D show that 4mer responds to ISRIB in the absence of eIF2Bα, and that ISRIB acts by stabilizing an octameric complex. This is entirely consistent with the reported cryo-EM data from the Walter group. Because of the low activity of the tetramer in the absence of eIF2Bα, it is challenging to obtain results in a phospho-eIF2α titration GEF experiment. However, this in and of itself is qualitative evidence that at least in our system, 4mer is sensitive to eIF2 phosphorylation status. This would be consistent with new work from Bogorad et al. (Nucleic Acids Res. 2017) elucidating the binding mechanism of phosphorylated eIF2α to eIF2B – they propose a possible binding surface involving the β and δ subunits of eIF2B. For the purposes of fitting/calculating the Km for WT and V183F eIF2Bα, we needed to generate Michaelis-Menten curves that began at the origin (0,0). Thus, we subtracted the basal rate of 4mer alone (the no α condition). Therefore, the left-most point on each curve does indeed begin at 0,0. We have updated the graph title and figure legend to clarify, and moved the panel to Figure 2—figure supplement 1 to make the main figure cleaner. 5) Figure 3 and discussion on in subsection “Correlation between eIF2B GEF activity and disease severity of VWMD mutants”. If the authors have the ability to generate labelled ISRIB, they could determine if its affinity for eIF2B is altered by L487W as they suggest, or is altered for the 4mer vs. 10mer forms. We attempted to generate 3H-labeled ISRIB to perform the requested experiment, but were unsuccessful due to issues with the compound’s poor solubility. However, the cryo-EM structure from David Ron’s group lab specifically highlights δL487 as a residue that forms part of the hydrophobic pocket for ISRIB’s aryl groups. We have also performed loading/release experiments using an unpublished 3H-labeled ISRIB analog and confirmed that the δL487W abrogates compound binding (data not shown). This comment was answered in the “Essential revisions” section above. We replaced Figure 4D with a new panel that includes the data for untreated cells as well as cells treated with ISRIB alone. We have also updated the supplementary panel (now Figure 4—figure supplement 3) to show the EC50 values for the response of the cells to Tg treatment. As can be seen, the EC50 of Tg treatment is similar between the different lines, indicating similar sensitivity to the stressor. In addition, in Figure 4E, we removed the redundant treatment condition of 1 mM DTT to make the panel more clear. We purified the recombinant εR113H mutant, and measured its GEF activity and holocomplex formation. Our results are consistent with previous finding, as well as our data from cell lysates with the same mutant, i.e. εR113H has impaired activity relative to WT and comparable activity to the εR195H mutant. We have incorporated this data into revised panels in Figure 2. The reviewer makes a good point. Our cursory estimations of the amount of eIF2B subunits in cells/tissues suggests that there is significant variation between cell types (partly illustrated in Figure 4—figure supplement 4A), ranging from single-digit nM to the low hundreds of nM. In cells, macromolecular crowding and potential binding partners may also influence complex stability. Our SEC experiments are performed with μM concentrations of purified protein. Presumably, instead of raising salt concentration, we could have achieved the same effect by lowering protein concentration, but this would place it below the detection limits of the assay. Ultimately, we believe that the differences revealed by our high salt SEC assay are reflective of real differences that occur in vivo. Concentration differences in different cell types could explain why somatic eIF2B mutations only manifest as pathology in the brain – perhaps levels of the subunits are particularly low in cells of that tissue. The use of phospho-eIF2 in our assays was not required to observe differences between the various mutants, but only to increase the dynamic range of the assay to ISRIB, in order to obtain better EC50 measurements. However, the inclusion of a small amount of phospho-eIF2 is likely a good mimic of the situation in vivo, where low level phosphorylation is present. It is particularly notable that progression of VWMD is exacerbated by insults such as head trauma or viral infection, which would trigger eIF2 phosphorylation. 3) Subsection “Several VWMD mutations reduce the protein level of the affected subunit in cells”, last paragraph. What epitope on the α subunit does the anti-eIF2Bα antibody recognize? If it is near V183, could the apparent reduction in α content be due to altered antibody affinity for the protein, rather than an actual decrease in the amount of protein expressed? We used a polyclonal antibody raised against the entire 305 aa sequence of eIF2Bα. Thus, we believe it is unlikely that the observed reduction in α content is simply due to a difference in epitope recognition. We measured eIF2B subunit levels in a panel of five cell lines and discovered that HEK293T cells do indeed have significantly elevated levels (including eIF2Bε) when normalized to total protein, even in comparison to another transformed cell line (HeLa). The data are presented in a new panel (Figure 4—figure supplement 4A). The use of HEK293Ts was due to the existence of the previously-characterized ATF4 reporter cell line (used in Sidrauski et al., 2013) as well as their ease of transfection, which facilitated generation of the VWMD mutants by CRISPR. 5) The authors speculate that "the basal activity of the δR483W mutant is so compromised that ISRIB-stimulated formation of even minimal levels of decamer have a drastic effect on GEF activity". However, the αV183F mutant has similarly low GEF activity (Figure 2B) and ISRIB caused a dramatic increase in formation of the decamer. Yet, the magnitude of the difference in GEF activity in the presence and absence of ISRIB is much lower than for the δR483W mutant. Please explain. This point was partially addressed as part of our responses to the Essential revisions and reviewer 1 above. We stress the difference between the concentration regimes used in the GEF assay (nM) and the SEC assay (μM). ISRIB’s ability to promote decamer function is limited if the α subunit itself has reduced affinity for the 4mer subcomplex (as is the case for αV183F). This is manifested as partial rescue of GEF activity when concentrations of the eIF2B subunits are low in the assay. In the SEC assay, concentrations of the eIF2B subunits are high and thus a large rescue of complex stability is observed. In Figure 2D, we show that using μM concentrations of αV183F while maintaining nM concentrations of 4mer, we can achieve complete rescue of GEF activity. We added text to the paragraph to explain which data points were used to calculate the values. In the process, we updated the value of ISRIB stimulation slightly to be more accurate (from 2.2X to 2.3X). We removed the statement about qualitative similarity. Our reporter experiment in Figure 4D is a better way of comparing across wild-type and mutant cells, with the added advantage of being a quantitative assay. We avoided using a common “loading control” (e.g. GAPDH, tubulin or actin) that would likely differ in concentration between different cell lines. We instead show the direct equivalent of a Ponceau stain, i.e. the total protein loaded into the capillaries of the Wes instrument. This confirms equal loading of total protein across our samples. We have updated Figure 4—figure supplement 4 with the new data. The authors were employees of Calico Life Sciences LLC at the time the study was conducted and have no other competing financial interests to declare. The authors were employees of AbbVie at the time the study was conducted and have no other competing financial interests to declare. Hock Ben Lim: The authors were employees of AbbVie at the time the study was conducted and have no other competing financial interests to declare. Chaohong Sun: The authors were employees of AbbVie at the time the study was conducted and have no other competing financial interests to declare. The author was an employee of Calico Life Sciences LLC at the time the study was conducted. The author is listed as an inventor on a patent application describing ISRIB. Rights to the patent application have been licensed to Calico Life Sciences LLC from the University of California, San Francisco. The author has no other competing financial interests to declare. This study was funded by Calico Life Sciences LLC. The authors thank John Wang and Dan Eaton for assistance with multi-angle light scattering measurements. We also thank Swathi Krishnan, Calvin Jan, Voytek Okreglak, Jeff Settleman, David Stokoe and David Botstein for critical reading of the manuscript. © 2018, Wong et al. The general translation initiation factor eIF2 is a major translational control point. Multiple signaling pathways in the integrated stress response phosphorylate eIF2 serine-51, inhibiting nucleotide exchange by eIF2B. ISRIB, a potent drug-like small molecule, renders cells insensitive to eIF2α phosphorylation and enhances cognitive function in rodents by blocking long-term depression. ISRIB was identified in a phenotypic cell-based screen, and its mechanism of action remained unknown. We now report that ISRIB is an activator of eIF2B. Our reporter-based shRNA screen revealed an eIF2B requirement for ISRIB activity. Our results define ISRIB as a symmetric molecule, show ISRIB-mediated stabilization of activated eIF2B dimers, and suggest that eIF2B4 (δ-subunit) contributes to the ISRIB binding site. We also developed new ISRIB analogs, improving its EC50 to 600 pM in cell culture. By modulating eIF2B function, ISRIB promises to be an invaluable tool in proof-of-principle studies aiming to ameliorate cognitive defects resulting from neurodegenerative diseases.